The Mayor of Savor, the Bangladesh town north of Dhaka where a factory collapse in April has killed 1,129 people, has been arrested over the disaster. Local police said Mayor Mohammad Refayet Ullah was arrested relating to the approval, and it’s alleged that nine floors were approved for Rana Plaza by Ullah’s office, though permission was originally given for only six. "We are determined to bring to justice everyone who had a hand in this, no matter how powerful," Bijoy Krishna Kar, assistant superintendent of the Criminal Investigation Department, told the Wall Street Journal. 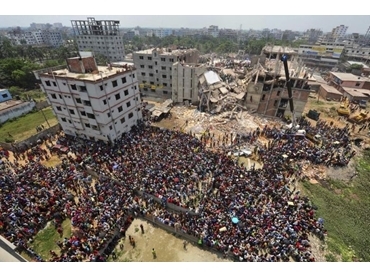 There have been over a dozen arrests related to the collapse of the nine-storey garment factory, reports Australia Network News.